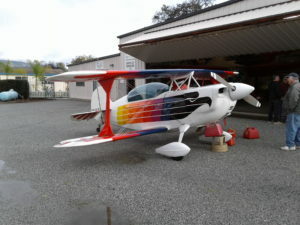 Designed to compete with the Pitts Special by Frank Christensen originally of Salt Lake City, Utah, the Eagle II is marketed in kit form for homebuilding. It set a new standard for completely documented homebuilding kits that revolutionized the homebuilding industry. The Eagle II is a small aircraft of conventional configuration with single-bay, equal-span staggered biplane wings braced with streamlined flying and landing wires and an I-strut to form a box truss. The pilot and a single passenger sit in tandem underneath a large bubble canopy. The tailwheel undercarriage is fixed, with the main wheels mounted on spring aluminum legs. The main wheels are housed in streamlined fairings. The fuselage and tail are constructed of chrome moly steel welded tube, with the forward fuselage skinned in aluminum and the rear fuselage and tail covered in fabric. The wing structure is Sitka spruce wood and fabric covered. The engine cowling is fiberglass. By 2011 over 350 aircraft were flying. In 1979, the Eagles Aerobatic Team (Charlie Hillard, Tom Poberezny, and Gene Soucy) chose the Christen Eagle as a replacement for their Pitts Special airshow act “The Red Devils”. The act continued until 1995. All three Christen Eagles hang from the lobby of the EAA AirVenture Museum in Oshkosh, Wisconsin. Single Seat Variant. Lycoming AEIO-540 260 hp (190 kW). First design model, built at the San Carlos Airport. 4 Airframes built, one was White with Black Feathers now based in Dallas Texas, the other 3 are in the EAA Museum in Oshkosh WI. Most common variant, two-seat dual controls. Lycoming AEIO-360 200 hp (150 kW). Several examples built, two seats, limited fuel tanks. ^ “Christen Eagles The Iron Eagles Aerobatic Team flew 2 identical Christen Eagle 540 aircraft from 1992-2014”. Archived from the original on 19 July 2011. Retrieved 29 March 2011. Taylor, Michael J. H. (1989). Jane’s Encyclopedia of Aviation. London: Studio Editions. p. 254. Jane’s All the World’s Aircraft 1987-88. London: Jane’s Yearbooks. pp. 585–85.